Please download and email your completed Job Application Form or your CV (no agencies) to [email protected] indicating the type of role you are looking for either Primary or Secondary. We are currently seeking to appoint a Teacher of Geography to join our successful team from September 2019. The successful applicant will be an inspirational forward thinker with a focus on developing exciting and engaging learning experiences and have a belief in our ‘can do’ culture where anything is possible. this might be just the job for you!. Applications are welcome from both NQTsand experiencedGeography teachers. An application form and further details can be found on Stowe Valley Multi Academy Trust website jobs section at www.stowevalleymat.com Completed applications should be sent to the College address or email [email protected] marked confidential. The College prospectus and further information can be found on the College website www.southamcollege.com. 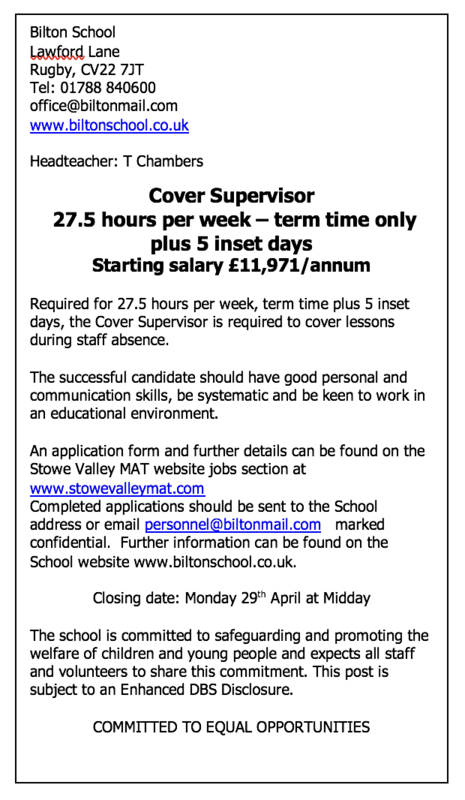 If you require further information about this Geography Teacher role please contact Sarah Fearn Human Resources Manager, Stowe Valley Multi Academy Trust 01926 812560. Please note that strong applications may be considered upon receipt. We are currently seeking to appoint an inspirational Teacher of Science to join our successful team from September 2019. Applications are welcome from both newly qualified and more experienced teachers. Regardless of your experience, the successful candidate will be an enthusiastic and committed teacher with strong subject knowledge, working in an outstanding department. You will be a forward thinker who believes in our ‘can do’ culture where anything is possible. At our school we value all our staff and every one of our 1645 students and see the investment in our staff as crucial as we look to build on previous successes for our students and across the school. As a large school there are extensive opportunities to teach throughout all Key Stages including Sixth Form (we currently have 298 students in our Sixth Form). We have an exemplary induction programme which provides an excellent foundation for career progression. It is a particularly exciting time to join us as we have recently become part of the newly formed Stowe Valley MAT, which is led by Southam College. This exciting development has further enhanced our ability to offer inspirational and supportive leadership and CPD for all of our staff. Passion is at the heart of our practice and it is essential that you have the ability to enthuse and motivate those around you. Be the best you can be! then this might be just the job for you! If you have a passion for learning and teaching and really want to make a difference to the lives of young people, we would encourage you to join us at our caring and friendly school. An application form and further details can be found on the Stowe Valley Multi Academy Trust website www.stowevalleymat.com Completed applications should be sent to the College address or email [email protected] marked confidential. The College prospectus and further information can be found on the College website www.southamcollege.com. We will accept CV’s in the first instance (No Agencies). If you require further information about this Science Teacher role please contact Sarah Fearn Human Resources Manager, Stowe Valley Multi Academy Trust 01926 812560. Southam College is committed to safeguarding children and young people. All applicants will be required to have checks made on their suitability to work with children including DBS (Disclosure and Barring Service and identity checks) in line with Warwickshire Safeguarding Children Board guidelines.